Paul Might Be Dead, But The Clues Are Going Live! The Paul McCartney Death Clues has consistently been one of the most-visited sections within my strange and spooky world. At first glance, that might seem odd for a web site that’s primarily focused on ghosts. But I think it just goes to show that, regardless of whether you’re talking about ghosts, monsters, UFOs, or the idea that Paul McCartney was killed in a car crash and replaced by a look-alike, people just like weird stuff. And the weirder, the better. So many clues for just one album cover. You should buy your own copy and see if you can find them all! Anyway, long before this blog existed, any time I felt the need to whip out all my PID (“Paul Is Dead” for those of you who have just fallen down this particular rabbit hole) materials (and boy, do I have more than my fair share of it), the thing I would hear most often was “man, you need to some sort of presentation where people can come to see and hear all this stuff”. Well, that time has finally come. I buried Paul: An In-Depth Examination of the Paul McCartney Death Clues. This is going to be a multi-media presentation where I bring out all my records, newspaper clippings, and tons of audio, and we’ll all roll up our sleeves and attempt to get to the bottom of this whole PID mystery. Starting with how the legend got started and who might have been responsible, we’ll take a magical mystery tour through all the Beatles’ albums (and their clues) associated with the legend. And yes, we’ll be playing some records backwards, too. For me, this is going to be a truly memorable evening if for no other reason than we’re all going to be gathered together, looking and listening for clues—pretty much what everyone was doing back in the late 1960s when this bizarre legend first broke. How cool is that? This presentation is free and open to the general public. Seating will be on a first-come, first-seated basis and there is currently no need to pre-register. But keep an eye on this blog and I will post any additional information if it becomes available. I know it’s still August, but the kids are already heading back to school, which means we’ll all be choking down all things Pumpkin Spice before you know it. So what better time to pull up your calendar and mark off when I’ll be coming to see you? This year, in addition to a bunch of new locations, I’ll be making return visits to a few places where I’ve given presentations before. In those instances, while I will be showing some of my “best of the best” audio, video, and photos, I’ll also be adding in some new things that I’ve acquired since my last visit. In other words, even if you’ve seen me before, there’s going to be new stuff for 2018! The vast majority of my appearances and presentations are free and open to the general public. The few exceptions will be noted with a dollar sign: $. For all dates, space is usually limited. Some locations even require that you pre-register in order to ensure they have enough seats. So once you’ve decided you’re going to attend, please contact the venue to see if you need to pre-register. Finally, yes, there will be books for sale before and after each appearance. And I will be more than happy to sign them or anything else you hold in front of me. And without further ado, here’s the tour dates! Any last-minute changes/additions will be available here. 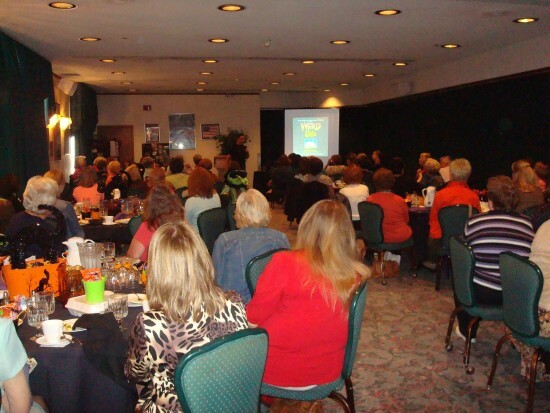 Over the years, I’ve given presentations at a wide variety of locations for an even wider variety of reasons. But the ones that are nearest and dearest to my heart are the ones that are done for a great cause. It’s a truly amazing and humbling experience to look out across an audience and know that we’ve all come together to share some strange and spooky stories and to help those less fortunate. That’s why I’m so happy to announce my next appearance: The Strange & Spooky World of James A. Willis—An Evening to Benefit the Humane Society Serving Clark County. This special, one night event will take place on Saturday, April 29th at The Heritage Center: 117 S Fountain Ave, Springfield, OH 45502. Proceeds to benefit the Humane Society Serving Clark County. Tickets are $25.00 each and can be purchased at the Humane Society front office, or by US Mail. The deadline for mail order tickets is noon on Saturday, April 22nd. Please be sure to include your full name and mailing address with your order. This will be a special evening in that I will be sharing my personal stories and experiences from my favorite strange and spooky locations that I have visited over the years. Plus, as if you needed any additional incentive, this will mark the very first time that I will be talking about some of the locations I visited for my upcoming book, Central Ohio Legends And Lore. So what are you waiting for? Reserve your seats and let’s pack the Heritage Center! The ice and snow earlier this week forced us to postpone the free presentation in Steubenville. But we’re back on track and there’s a new date! That new date is Monday, March 7th at 6:00 pm. The presentation will be held at the Steubenville-Schiappa Branch Library, which is located at 4141 Mall Drive in Steubenville. Here it is: My October 2nd, 2015 interview on WCIT (940 AM) out of Lima. I talk about my involvement with the Lima Lantern Tours, my book, Ohio’s Historic Haunts, and some assorted spookiness. Interview starts right around the 9:35 mark. Just give a click below to start listening. This October, Lima, I’ve Got Something Special For You! I may have taken part in a bunch of the Lima Lantern Tours over the years, but nothing compares to what’s going to happen in Lima on October 3rd! Let’s be honest: My love for all things Lima goes deeper than Kewpee, the Greely Road Crybaby Bridge, and even that spooky, off-limits building way up in the hills. Lima’s just a weird place, plain and simple. So why wouldn’t a weirdo like me love it? And I’d like to think that over the years, Lima has returned the love. It certainly felt that way on the numerous Lantern Tours I took part in. But something in me felt that this year, I needed to give Lima a little something extra. Something special they wouldn’t soon forget. You see, I tend to get very animated when I share my own personal ghost stories. I wave my arms and I pace back and forth—two things that can make for some awkward moments when you’re snuggled so close together in the back of a trolley making its way down Main Street in Lima, Ohio. But more than that, it sometimes became hard to tell my ghost stories because Lima is just so chock full of strange and spooky history that I often felt I was stomping on all the other cool stories. So I would often hold back on my storytelling, especially since many of my stories needed to be seen to be believed in that it’s often hard to explain exactly what our video cameras picked up on an investigation or what the spooky noises really sounded like. To be honest, there’s not much room on a trolley car for a projector and video screen. So by and large, my favorite ghost stories remained untold. On Saturday, October 3rd, I’ll be heading over to Lima’s Encore Theater and giving you something truly unique: A special presentation that will feature the best of the best of my collection of ghost stories. Not only that, but I’ll be bringing along audio, video, and photographs of strange and spooky things I’ve captured over the years. Things I can’t explain. And since I included Lima’s own Literacy Council in my upcoming book, Ohio’s Historic Haunts, what better time to let everyone in on some behind-the-scenes secrets of my investigations inside that building? Want to know the different types of equipment I used? Curious as to what “evidence” I walked away with? Want to hear and see the “evidence” for yourselves? Well then, October 3rd will be your chance! I’ll also be taking your questions and will be hanging around after the presentation to ensure you get all your ghostly questions answered. 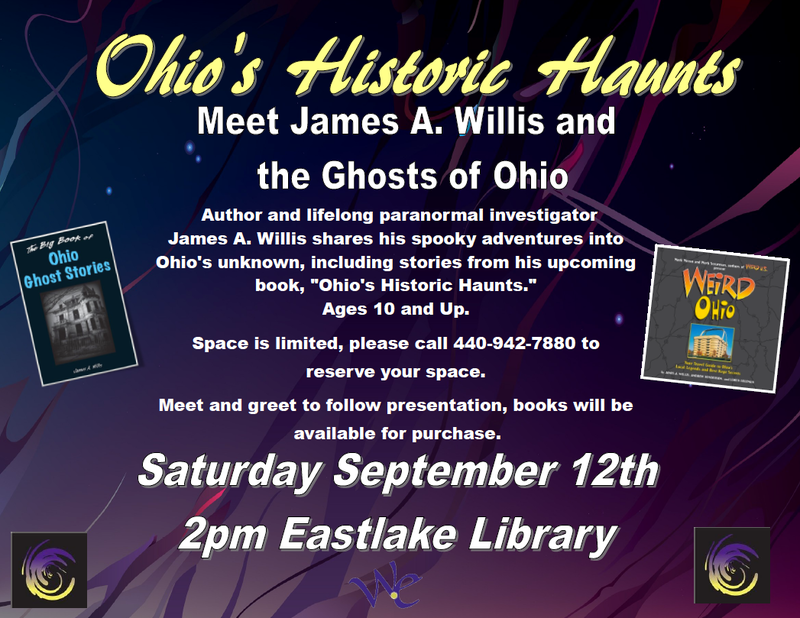 And since my book, Ohio’s Historic Haunts, is coming out on September 30th, a mere three days before the Lima appearance, I’ll make sure I bring along loads of that book (as well as some of my other titles) for you to purchase and have signed. Put another way: You might have seen me in Lima before, but you’ve never seen me like this! Tickets are only $5.00 each with proceeds going to Downtown Lima, Inc., an organization dedicated to creating and maintaining a dynamic, vital, and sustainable downtown. So for just $5.00, you’ll get to hear some great strange and spooky stories and help downtown Lima. It doesn’t get any better than that! BTW, while this presentation is suitable for all ages, given the subject matter, it is not recommended for children under the age of 10. So what are you waiting for? Click here to order tickets. 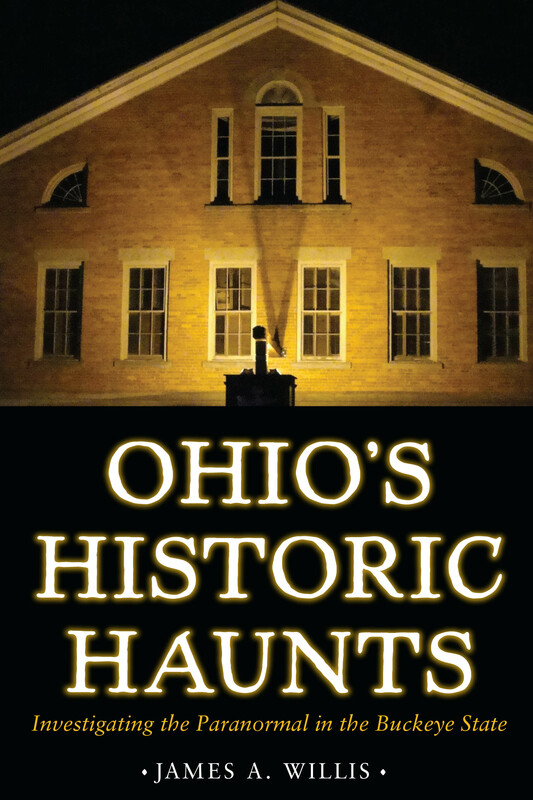 While the official release date for Ohio’s Historic Haunts is September 30th, the publisher, Kent State University Press, has decided to release some copies ahead of time. The reason for this is a super-cool pre-release book signing on the campus of Kent State University! So on Saturday, September 26th, you can swing by the Kent State University Book Store (located at 1085 Risman Drive [124 Student Ctr], Kent, Ohio) and grab yourself a first edition of Ohio’s Historic Haunts. I will be there between the hours of 2 and 4 pm and will be more than happy to sign your book (and anything else you want me to) for you. After that, you can proudly walk to your car carrying your autographed first edition, a full 4 days before the general public has a chance to get their hands on a copy! This event is free and open to the public. For more information, visit the campus book store’s website here. If you can’t make it on the 26th, I will have copies available for purchase at all of my upcoming presentations and appearances. You can always grab a copy off Amazon, too! OK, here’s some exciting news for you: I’ll not only be doing a special presentation at Farnam Manor, one of the locations featured in my upcoming book, Ohio’s Historic Haunts, but you’ll also have the opportunity to ghost hunt with me and members of The Ghosts of Ohio! It all begins at 7:00 pm on Saturday, September 26th. I will be giving a special talk at Farnam Manor that will showcase some of the strangest and spookiest places I’ve visited in my 30+ years investigating the paranormal. 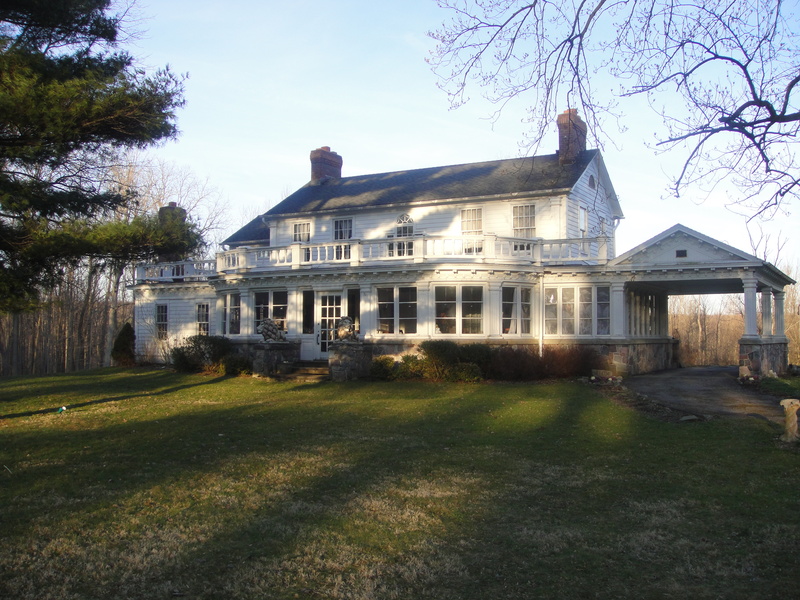 A large portion of the presentation will focus on what happened the night I visited Farnam Manor for my book. 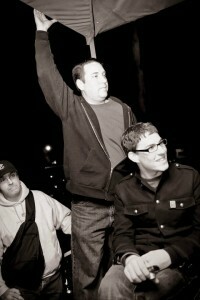 Members of The Ghosts of Ohio who accompanied me that night will also be on hand to share their personal stories. 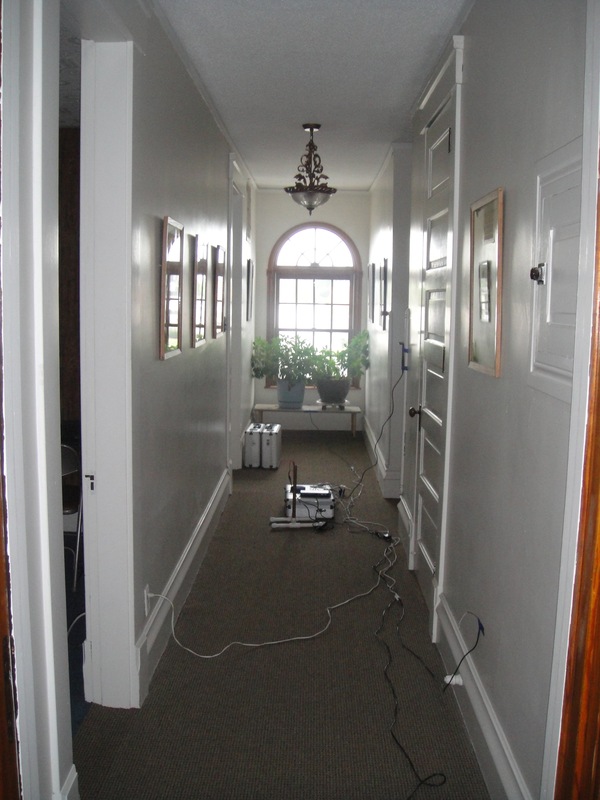 Then, after a tour of Farnam Manor, a very lucky few will have the opportunity to conduct a mini-ghost hunt at Farnam Manor with myself and The Ghosts of Ohio. Tickets are available for the presentation, the ghost hunt, or both. But they won’t last, so grab yours today by clicking here now. The event will take place on October 23rd at the famous Clay Haus restaurant in Somerset, Ohio, which is also featured in my upcoming book, Ohio’s Historic Haunts. Things will get underway at 6:00 pm with a special dinner provided by Clay Haus. After that, we will all be headed downstairs for a special presentation, showcasing some of the weirdest photos, videos, and bits of audio I’ve managed to capture over the years. Of course, there will be plenty of time spent discussing what happened when I spent the night inside Clay Haus for my book. I will even have some special guests with me who will share their experiences, too. As if that wasn’t enough, here’s some more coolness: proceeds from the ticket sales all go to the Nellie Sheridan Wilson Statue Committee. This committee, which is comprised of members of the Perry County Historical and Cultural Arts Society, was formed in 2014 with the sole purpose of raising funds to erect a statue of Nellie Sheridan Wilson near Somerset’s town square. In other words, by purchasing a ticket to hear me talk about ghosts, you’re helping get a historical statue erected. How cool is that? Tickets to this special event are extremely limited. In fact, there are only 50 seats available. And they are going to go fast! To purchase your tickets, send an e-mail to Gerald Bryant at jbryant0225@gmail.com. Title it something like “tickets for James Willis at Clay Haus” so it gets to the right place and be sure to let him know how many tickets you’re interested in. Gerald will get back to you with information on how to purchase the tickets if they are still available. Sorry, but I am not handling the ticket sales, so you can’t order them through me. Best of luck snagging these tickets! Hope to see you on October 23rd! For more information on Nellie Sheridan Wilson and the plans for the statue, go here. Visit the Clay Haus’ web site by clicking here. Look! There’s an official poster for my upcoming appearance at the Eastlake Public Library this September! It’s free, but you will need to pre-register in order to make sure they have enough seats. This will be my first appearance at this library, so you might want to grab your seats as soon as they become available. Pre-registration begins bright and early on Monday, August 17th. You can call the number on the poster or register online by following this link: PRE-REGISTER HERE. As for what I’ll be speaking about, it will be the usual spooky stuff, although there will be a lot of new video, audio, and photographs, especially since this will be my first time in Eastlake. Of course, I’ll also be talking about Ohio’s Historic Haunts and maybe, just maybe, I’ll bring along some members of The Ghosts Of Ohio so you can really get a behind-the-scenes look at things!